This exceptional table is one of our best-sellers - and it's easy to see why. 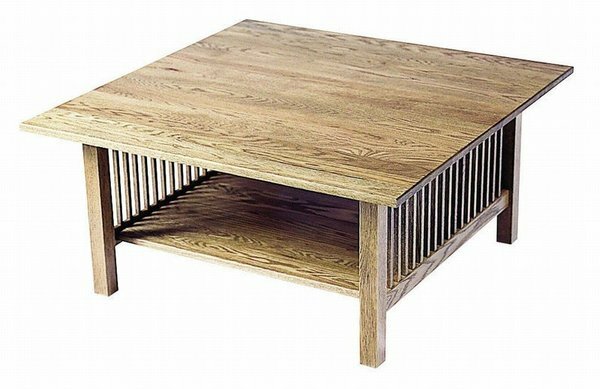 At the heart of this American Mission Coffee Table are two rows of intricate and beautiful Mission-style slats that run along the length of the table, supporting the flat tabletop with beauty and integrity. The strength of the solid wood used in every inch of the American Mission means that it will happily serve decades' worth of coffee cups, books, magazines and other living room essentials without cracking or breaking, always keeping its precious contents stable, safe, and easy to enjoy. Every element of the American Mission is built to order in a small Amish woodshop in the northern United States, promising you nothing but the best in home-grown quality and attention to detail. Your coffee table will be crafted, finished, and then sanded by hand using the materials you choose from the menus above. Simply make your wood and stain selection to get started. If you've any questions about this beautiful piece, or if you would like to see free physical samples of any of our woods and stains, please reach out to us by phone or by email. Our goal is to bring your vision to life in its every detail, and it would be our pleasure to talk to you about the wonderful combination of display space and traditional family coffee table that the Lancaster brings to the living room.